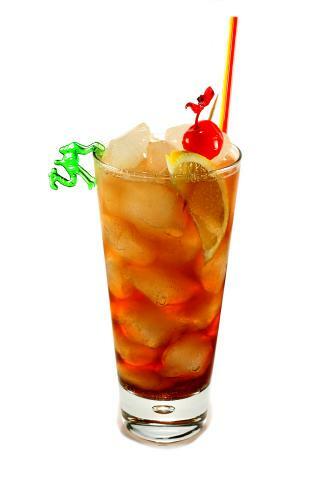 Long Island Ice Tea – created in the 1970’s on Long Island, New York doesn’t actually contain tea, but is supposed to taste similar. It’s a hugely popular drink, served almost everywhere. I’m sharing this recipe as Sander is going to be making these at his New Years Party this year, and needed to know exactly what was needed. I’ve included a recipe for Sweet & Sour Mix, with some variations as well. Combine the water and sugar into a large sauce pan. Stir over medium heat until the sugar dissolves. Bring to a boil, and then boil for 5 minutes. Cool. Add in the lemon & lime juices. Stir to mix and then refrigerate. This can be kept for about a week in the refrigerator. Mix together well, and allow to sit for 4-24 hours. Stir occasionally, making sure the sugar is dissolved. To get the most juice out of lemons and limes, roll them around on the counter, using medium pressure, to break the cells holding the juice. Using a mix of lemon and lime, works for just about everything you’d need a sour mix for. In the US, Sour mix is used quite a lot. However, in Europe, sour mix is usually left out of drink mixes, being substituted for Lime Cordial, or lemon/lime juice. This entry was posted in Alcohol and tagged Alcohol, Drinks, long island iced tea, New Years, sour mix, sweet & sour mix. Bookmark the permalink.